Operated ships registered in Israel (Zim Line). U.S. and Canadian agents: American Israeli Shipping Co.
? U.S. Gulf ports, U.S./Canadian Great Lakes and Atlantic ports, Freetown, Monrovia, Takoradi, Tema (Accra), Lagos, Port Harcourt, Douala. 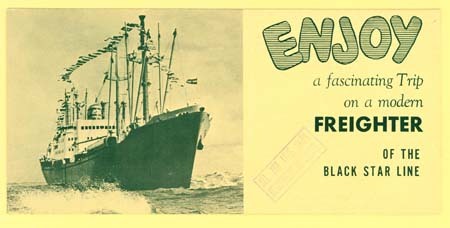 See the archives section for more brochures of Black Star Line.